It has to be said, as a person who generally goes through life from kerfuffle to kerfuffle, there aren’t that many times that I get to feel really pleased with myself. One of those rare moments came a couple of weeks ago though, when out of the blue I was contacted by the lovely Clare from Seventeen (superb name, it has to be said). She had read my recent makeup review of their new highlighter and primer – which you can read here if you so wish – and emailed me just to say how much she had enjoyed it. It was so nice to hear that brands read what we write (I was especially delighted that she’d liked my ‘Pore-tsmouth’ joke, which I personally thought was a corker) and so the email in itself was enough to make my day – but then Clare said she would love to send us a few other bits to try out. Cue me becoming the most excited person in the world, and Seventeen automatically jumping right to the top of my Nicest Brands EVER list. Two of the products I received a couple of days later were the brand new Stay Time Foundation in shade ‘Natural’, and the Stay Time Long Wear Primer. 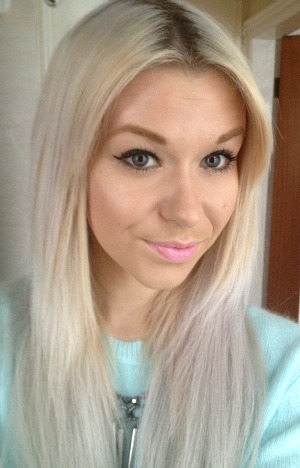 Longevisty is definitely one of the most important things for me when it comes to makeup. I have very long days, generally leaving the house before 7am and often not getting in again until 8pm. My commute to work also includes a horrible bus journey and around half an hour of walking each way, so depending on the weather my makeup is seriously put to the test. This new range’s promise of a long lasting base, then, was music to my ears and I couln’t wait to give it a whirl. Firstly, the primer. It’s very different to the Flawless Poreless Primer, which in my review I describe as being a very thin balm which you can barely see or feel. 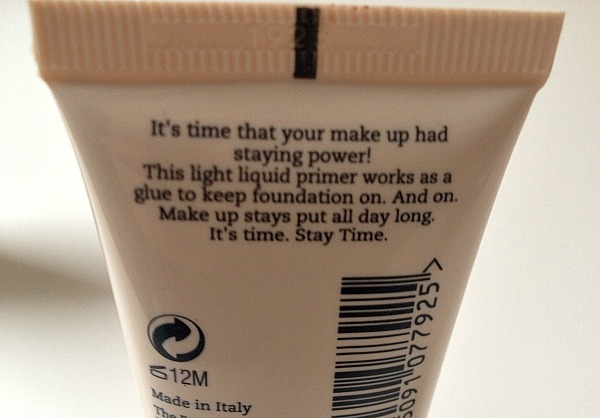 Stay Time Primer is the more standard liquid primer that I’m used to. A thin layer of it goes on almost invisibly, but leaves you with a noticeable, slightly tacky base to work with. This sounds unpleasant, but it’s really not. Next, the foundation. For one, I really like the packaging. You can’t really see in the photo but the pump twists around to lock and unlock – perfect for people like me (what some may call ‘idiots’) who are always losing lids and finding their makeup swimming in leaked foundation. At first I thought that shade ‘Natural’ might be too dark for me, but actually once I started applying it I was pleasantly surprised that I think my pale skin tone can just about get away with it. I buffed it into my skin with my usual brush, and have to admit I did find it a bit tricky to blend. I’m not sure whether it was the foundation itself or, as I suspect, the surface that the primer had created that made it a bit stubborn. I persevered though and was actually incredibly pleased with the result. Although it’s not listed as one of the benefits, the Stay Time Foundation provided a lovely matte finish, which is perfect for me. It also promises full coverage, which I can confirm it delivers – yesterday I had an extremely attractive spot develop right at the side of my nose, and today the SPOT IT HIDDEN. The coverage might be a bit too heavy for some people, especially when combined with the primer, but generally I like heavy coverage so it was great for me. I was also shocked, nay GOBSMACKED, after raving on about Flawless Poreless so much, to see that my pores are even less visible when using the Stay Time products than they are with that – so a huge thumbs up. And what about the most important thing – the 25 hour lasting claims? Well, obviously, I haven’t tested it for a full 25 hours – I don’t know what sort of lives Seventeen’s target market lead, but I for one am usually in bed by half ten with a cup of tea and my Kindle. It did get tested on one of my busy work days, though, and I have to say I am hugely impressed! I had to touch up my powder and blusher through the day as usual, but when I got home in the evening my foundation was looking considerably fresher than it usually would at that time. I would definitely recommend the Stay Time range to people who like a full coverage, or for those those who have a busy day ahead of them and want to be sure their makeup is staying put. I also think this will be great for a night out, when we generally want a heavier coverage anyway (and might actually stay up past – gasp – eleven pm!) Overall, I’m really impressed with these products and they’ve continued to change my perception of the Seventeen brand. 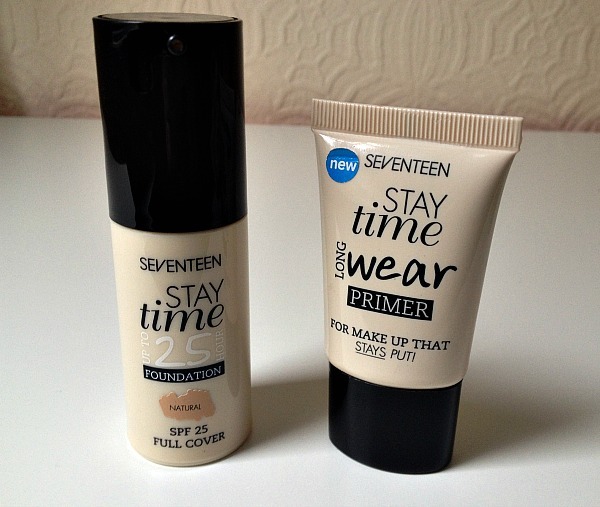 The primer retails in Boots for £5.49, while the foundation costs £6.49. Have any of you tried these products? What do you think of the Seventeen brand? Fab post! I’ve never used Seventeen before, these sound fab tho! I’ve never used seventeen until recently, just assuming that the cheaper price meant poorer quality, but I’ve recently bought a lovely lipstick and ended up getting a free eyebrow kit which is perfect and just as good as the premium brand eyebrow kits. So now I’ve just bought the primer and the lovely cream eyeshadows so I hope they’ll be just as wonderful and I’ll have saved myself a small fortune!